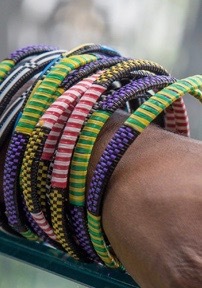 These colorful, handwoven Burkinabé bracelets were made out of recycled plastic bags specifically for KOKÚMỌ by the people of Burkina Faso. Each purchase comes with three (3) bracelets. All bracelets vary slightly and no particular color or style is guaranteed. Limited Inventory. Two Sizes: Small (2.25 - 2.5 inches in diameter) and Regular (2.5 - 2.75 inches in diameter).